*Please submit agenda items at least 3 days in advance. Starting August 27, the FAA announced that, weather permitting, it would begin allowing limited use of Runway 35 for arriving aircraft at Minneapolis-St. Paul International Airport (MSP) after having temporarily suspended arrivals on that runway a month ago due to changes in safety requirements. The procedures being tested do not create new flight paths; however, residents who became accustomed to the suspension of Runway 35 arrivals will observe arrival activity once again now that the suspension is lifted. In November, property owners will receive a notice that shows the impact of the county maximum levy on their properties, as well as the impact of taxes proposed by other local units of government, such as cities and school districts. Tuesday, September 22, 1:30 p.m.
County Board adopts 2016 maximum tax levy and budget. Monday, November 2, 1 p.m. to 4 p.m.
Tuesday, December 1, 6 p.m.
Thursday, December 10, 9 a.m. to 11 a.m.
Tuesday, December 15, 1:30 p.m.
County Board will approve the 2016 budget and levy at its regularly scheduled board meeting. Volunteer MPS actively works to support the learning and achievement of all students in Minneapolis Public Schools. They provide training to community volunteers who engage in meaningful volunteer assignments that meet a demonstrated need in our schools. Check out opportunities and programs online. The Board of Education invites you to take the online survey and share the characteristics you look for in the next MPS superintendent. The online survey is available now through September 17th and is accessible in Spanish, Somali, Hmong, and English. CLICK HERE to take the Community Superintendent Search Survey. More details about the process are available online. Do you need before or after school childcare? If so, Rec Plus provides affordable childcare for children ages 5-12 (must be in grades K-6) at neighborhood recreation centers. Activities include games and sports, arts and crafts, homework help, field trips and nutritious snacks. We understand homework can be hard but our homework help program is here to HELP you! Reduce your stress and stop in for Homework Help – it is free, offered throughout the city with varying hours, though not at Armatage park at this time. All this and more through our neighborhood parks. Check it all out in the MPRB fall activity guide. The Minneapolis Bike Tour is a family oriented, recreational tour which takes place on Sunday, September 20, 2015 at 8 am. The tour is great for all ages and abilities and spans the Grand Rounds Scenic Byway System. The Minneapolis Bike Tour was created to bring cyclists together and support bike related initiatives. Proceeds from the Minneapolis Bike Tour will benefit bike safety and education events for Minneapolis youth as well as bike trail improvement projects throughout the system. The Washburn Games is a noncompetitive sports sampler for children ages 4-12. The Games features over 20 different sports, a great way for kids to test our what sports they like before they are signed up for a sport they don’t like! Besides getting active, youngsters also have the opportunity to learn about community giving. Children are encouraged to raise funds before the event to support local nonprofit Washburn Center for Children, Minnesota’s leading children’s mental health facility. Children who raise $100 or more are entered into a fun prize drawing, including Water Park of America tickets, passes Wild Mountain, and a $1,000 educational scholarship. All children who come to the Games will receive a medal, T-shirt and goodie bag! It’s day full of family fun, community building and getting active! The event will be held on Sunday, September 27th between 1:30-4:30 PM. It will be held at Bryn Mawr Meadows, located at 400 Morgan Ave, Minneapolis, MN 55405. There is a $10 registration fee and readers can sign up and learn more at www.washburngames.org . Traffic circles are becoming more and more prevalent as cities look to install low-maintenance, bicycle-friendly traffic calming devices. A traffic circle is a small, circular island (much smaller than an actual roundabout) at the center of the intersection that slows traffic, causing vehicles to maneuver around the circle. Armatage residents have likely seen the traffic circle recently installed at 58th & Upton as part of the Upton bicycle boulevard project. At 40th & Zenith, a traffic circle is being tested to control speeds on Zenith and prevent additional right-angle crashes. The test consists of yield signs facing all legs of the intersection, orange delineators for the circle itself, and signage in the center of the intersection directing traffic to move in a counter-clockwise direction (to the right). This test circle will be removed before winter snow removal activities begin. If you have comments about the circle, I encourage you to call 311 to share your thoughts. The maneuvering around traffic circles, however, is still new to many of us. The key point to remember is this: all cars must slow on approach and yield to vehicles already in the traffic circle. 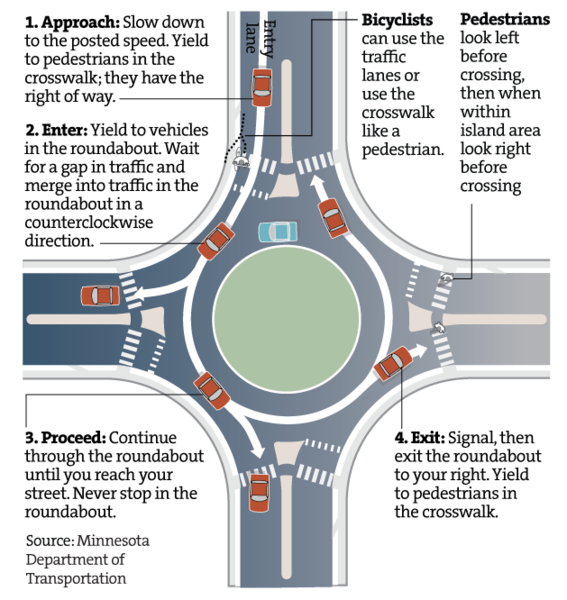 If you’d like a refresher on how to drive safely around a traffic circle, check out the diagram below, and watch this video (while the diagram and the video covers roundabout use, most of the principles still apply). This entry was posted in About Town, Agenda, Airport Noise, City Budget, Park, Safety, School on September 10, 2015 by anacoordinator.